The new cast of THE FERRYMAN by Jez Butterworth on Broadway. 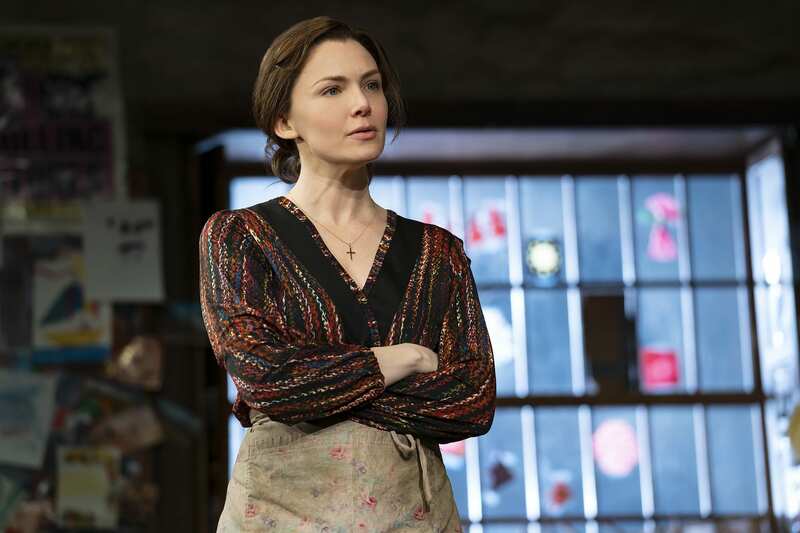 The new cast of The Ferryman at the Jacobs Theater continues to bring affection and intensity to Jez Butterworth’s epic. Of the cast of 21 actors to take the stage each evening only 5 original cast members remain, welcoming 16 new actors to the large, lovable, energetic and troubled Carney family (this number will soon shift to 17, as Blair Brown replaces original cast member Finnula Flanagan as Aunt Maggie Far Away). 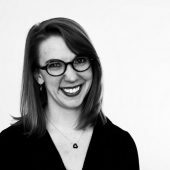 Butterworth’s writing takes time over the three-hour piece to showcase each member of the family as both a part of the Carney collective and an individual – some with differing viewpoints on the nature of love and relationships, politics and the IRA. Brian D’Arcy James replaces Paddy Considine as Quinn Carney, the patriarch or the Carney family, delivering an impassioned performance of the play’s antihero. Struggling to keep his family together while fighting off demons (both real and metaphoric) from his previous life in the IRA, James brings a heaviness to Quinn Carney that can be felt from many rows into the orchestra. Even during lighter moments within the piece James’ Quinn is more reserved, coupling a love for his family with a worried care for what may be yet to come. James’ performance volleys between tenderness for his children and those he loves with the volatile passion of a man who is at the edge of something incredibly dangerous that could (at any moment) erupt. Quinn’s troubled wife, Mary Carney, is played wonderfully by new cast member Emily Bergl. Bergl delicately inhabits the emotionally fraught Mary, who begins the piece suffering from a long-lasting and untreatable “virus,” eventually revealing her fierce love for her husband and seven children, and her desire to fight to preserve it at all costs. Holly Fain, who takes on the role of Caitlin Carney from original cast member Laura Donnelly, captures the desperate energy of a woman who has been living off a thin thread of hope for the past ten years (but what she is hoping for may not be what we initially expect). At her wit’s end, Fain brings a beautiful and youthful energy to the tragic Caitlin and we follow her every movement and every word as the thread begins to unravel. The other Carneys are performed with just as much passion and strength as their familial leaders. Elders Pat and Pat (now performed by Fred Applegate and Ann McDonough) bring a much needed humor to the weighty tale and the seven children of the Carneys (two of whom remain from the original cast) as well as their cousins the Corcorans bring energy and passion: turning up the music and dancing at the Harvest Feast, providing a youthful context for the current political struggles of 1981 Northern Ireland. Shuler Hensley (center) as Tom Kettle, and the company of THE FERRYMAN on Broadway. Of the non-family cast members, a special stand out is Shuler Hensley, who replaces Justin Edwards as Tom Kettle. Hensley’s sincerity and honesty in the role of the “not the full bucket” Kettle will bring tears to your eyes. 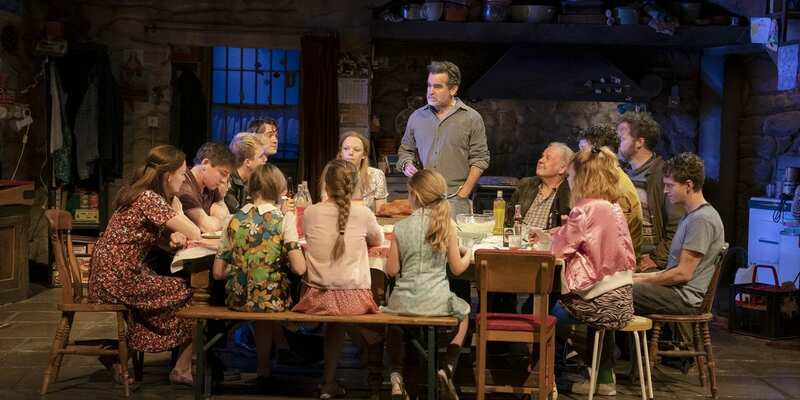 If reviews of The Ferryman piqued your interest, don’t let the fact that the original cast is no longer with the production dissuade you. 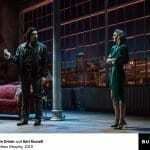 This Broadway second casting was expertly brought on board by the new cast director, Tim Hoare. 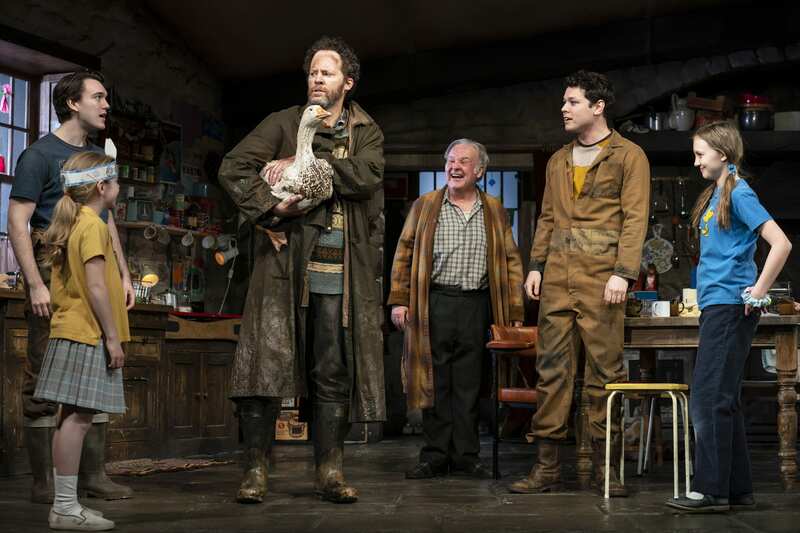 The Ferryman is still a show that you won’t want to miss. WITH: Fred Applegate (Uncle Patrick Carney); Emily Bergl (Mary Carney); Ralph Brown (Muldoon); Charles Dale (Father Horrigan); Sean Delaney (Michael Carney); Jack DiFalco (Shane Corcoran); Ethan Dubin (Oisin Carney); Holley Fain (Caitlin Carney); Fionnula Flanagan (Aunt Maggie Far Away); Shuler Hensley (Tom Kettle); Brian D’Arcy James (Quinn Carney); Terence Keeley (Diarmaid Corcoran); Collin Kelly-Sordelet (James Joseph JJ Carney); Matilda Lawler (Honor Carney); Michael Quinton McArthur (Declan Corcoran); Willow McCarthy (Mercy Carney); Ann McDonough (Aunt Patricia Carney); Julia Nightingale (Shena Carney); Brooklyn Shuck (Nunu Carney); Glenn Speers (Lawrence Malone); Graham Winton (Frank Magennis); Sean Frank Coffey, Alexandros Kekos-Presson, Ryder Koehle, Annie Scarfuto (Bobby Carney). Design by Rob Howell; lighting by Peter Mumford; sound and compositions by Nick Powell; US Casting by Jim Carnahan and Jillian Cimini; choreography by Scarlett Mackmin; resident direction by Benjamin Endsley Klein; hair, wigs, and makeup by Campbell Young Associates; production management by Aurora Productions; production stage management by Jill Cordle; animal training by William Berloni; US fight direction by Thomas Schall; US dialect coaching by Deborah Hecht; US general management by Bespoke Theatricals; directed by Sam Mendes; new cast direction by Tim Hoare. 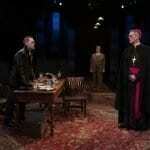 At the Jacobs Theater (242 W 45th St); www.theferrymanbroadway.com; 212-239-6200.